I make replicas of many vintage Fender and Gibson pickups; this one is my SSL-1, the Staggered Strat. I make it just like the original--not for cosmetic reasons, but because if you change the way a pickup is made, you change the way it sounds. 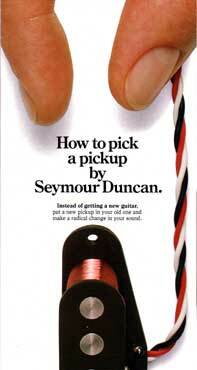 The original Stratocaster* pickup had magnetic pole pieces with staggered heights; the mixture of intensity of the magnetic fields gave birth to the unique vintage Strat* sound. Every detail is important to duplicate the fat full sound and top-end bite that made the vintage Strat* famous. 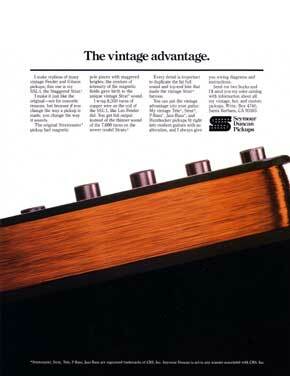 You can put the vintage advantage into your guitar. My vintage Tele*, Strat*, P-Bass*, Jazz-Bass*, and Humbucker pickups fit right into modem guitars with no alteration, and I always give you wiring diagrams and instructions.